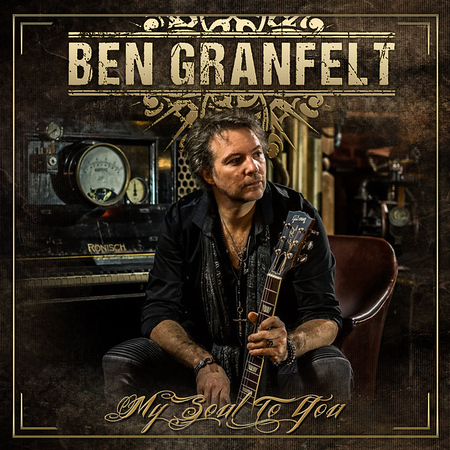 “My Soul To You” is the latest blues rock album from Finnish guitarist Ben Granfelt and it was released on 15th June via A1 Records. Granfelt will be best known for his time with the Leningrad Cowboys and Wishbone Ash, but his solo albums, where he takes on the role of lead vocalist, have also gained him an international following. This is his 16th solo release since 1994. I included the title track on the Friday NI Rocks Show on 1st June and “Weight of the World” on the Show on 22nd June. Granfelt was a member of Gringos Locos in the 80’s before joining Leningrad Cowboys in 1992; releasing three studio albums and two live albums before departing in 1996. He also released 4 albums with the Guitar Slingers between 1994 and 1998 and the first of his solo albums in 1994. Following the release of his tenth solo album “Kaleidoscope” in 2009 he went on to perform with Finnish band Los Bastardos Finlandeses and record three albums. “My Soul To You” features Ben Granfelt on lead vocals and guitar, Masa Maijanen on bass and Okko Laru on drums. Granfelt’s wife Jasmine Wynamts-Granfelt also sings on the cover of P J Harvey’s “This Is Love” and Wishbone Ash guitarist also guests on the same track. Former Los Bastardos Finlandeses frontman and bass player Bryn Jones provides additional vocals on the track “The Heroine”. There are ten great blues rock tracks on the album, including the instrumental “Sunrise”, and it is definitely worth checking out!